This certificate forms the second aspect of reducing air pollution, that is reducing fuel consumption. It is required by regulation 5.4 of Annex VI of MARPOL. That the ship has been surveyed in accordance with regulation 5.4 of Annex VI of the Convention; and That the survey shows that the ship complies with the applicable requirements in regulation 20, regulation 21 and regulation 22. What must be attached to the certificate? Supplement to the International Energy Efficiency Certificate, a Record of construction relating to energy efficiency. A Record of construction relating to energy efficiency. What is contained in the supplement? A Technical File is a record containing all details of parameters, including component and settings of an engine, which may influence the NOx emission of the engine, in accordance with 2.4 of the NOx TECHNICAL CODE (2008). 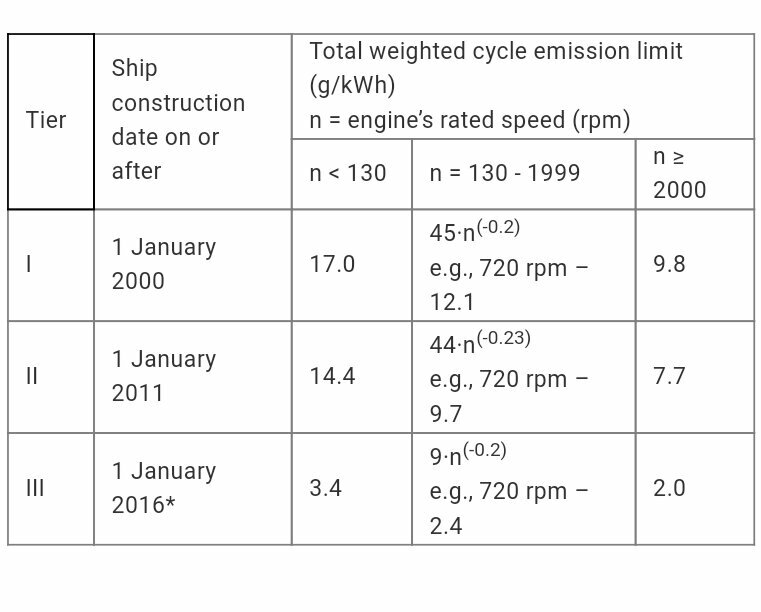 Energy Efficiency Design Index, a specific figure for an individual ship design, expressed in grams of carbon dioxide (CO2) per ship’s capacity-mile (the smaller the EEDI the more energy efficient ship design) and is calculated by a formula based on the technical design parameters for a given ship. Here is the first of two ship certificates associated the last Annex of MARPOL; an annex that aims to reduce pollution of the air above vessels. For those visiting this blog for the first time, here is a link of where to find information about ship certification on other websites. This is the final part of environmental protection contained within MARPOL. Clean air is the topic of Annex VI of the Convention. Regulation 5 of Annex VI of MARPOL. Which ships must carry the certificate? Every ship of 400 gross tonnage and above. What emissions are covered by the certificate? What information in contained on the certificate? What record book is required to be kept? Each ship which has rechargeable systems that contain ozone depleting substances shall maintain an Ozone Depleting Substances Record Book. What engines are require compliance with the NOX regulations? Marine diesel engines with a power output of more than 130 kW installed on a ship, but does apply to diesel engine intended to be used solely for emergencies, or solely to power any device or equipment intended to be used solely for emergencies on the ship on which it is installed, or installed on the ship’s lifeboats. What is the tier of an engine? It is back to the environmental relatated certificates again after the diversion into HSSC. So far oil and noxious liquids have been covered, both with their own Annex within MARPOL, and this post’s topic also has its own Annex, Sewage. Ships engaged in international voyages that are 400 gross tonnage and above orf less than 400 gross tonnage which are certified to carry more than 15 persons. For a period specified by the Administration which shall not exceed five years. When the renewal survey is completed within three months before the expiry date of the existing Certificate, the new Certificate shall be valid from the date of completion of the renewal survey to a date not exceeding five years from the date of expiry of the existing Certificate. When the renewal survey is completed after the expiry date of the existing Certificate, the new Certificate shall be valid from the date of completion of the renewal survey to a date not exceeding five years from the date of expiry of the existing Certificate. What equipment is covered by the certificate? What is shown on the certificate? A pipeline for the discharge of sewage to a reception facility, fitted with a standard shore connection. Note: A Comminutors are used to reduce the particle size of wastewater solids. That the ship is equipped with a sewage treatment plant/comminuter/ holding tank and a discharge pipeline in compliance with regulations 9 and 10 of Annex IV of MARPOL. That the ship has been surveyed in accordance with regulation 4 of Annex IV of MARPOL. That the survey shows that the structure, equipment, systems, fittings, arrangements and material of the ship and the condition thereof are in all respects satisfactory and that the ship complies with the applicable requirements of Annex IV of MARPOL. An additional survey after any important repairs or renewals are made.